Comprising 6 species, this small genus belongs to the narrow-mouth anuran family Microhylidae (Günter, 1859), subfamily Scaphiophryninae (Laurent, 1946) and is restricted to the island of Madagascar. It is slowly increasing in popularity with a few species now beginning to crop up regularly on dealers lists, although in the main, they do not make a visually appealing vivarium subject on account of fossorial habits. However, they seem to be easy to keep and potentially long-lived frogs. 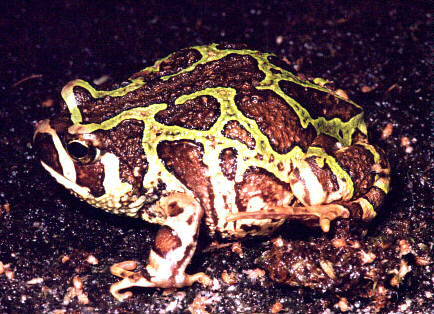 The name 'burrowing frog' tends to be rather too broad where these anurans are concerned. Certainly some of them are highly fossorial, however some are now know to be semi-scansorial or simply terrestrial. Of the six species, the green burrower is perhaps the most familiar in the pet trade. Attaining 40mm in females and 30mm in males, this very plump, conspicuous green frog is probably the most diverse, spending much of its time burrowed in leaf litter, yet at the times it takes to low shrubs and trees in search of food and refuge. The ends of the long digits of its long front limbs are ridiculously large sometimes making mobility rather clumsy as they seem to constantly get in the way. However for climbing they provide excellent purchase. Conversely the short, powerful hind limbs have well developed metatarsal tubercles or 'spades' and are utilized for excavating. The head is flattened with a bull-nose ideal for burrowing. 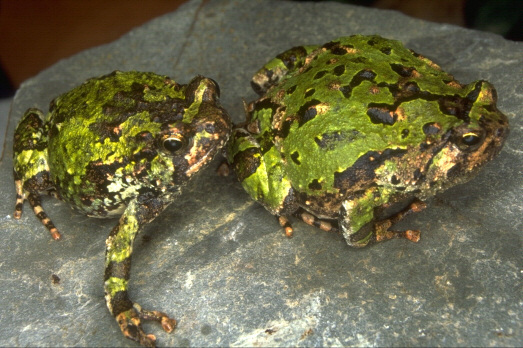 The skin on the dorsum is very spiny and is coloured in a mottled array of dark and iridescent greens. Very shy by nature, when threatened this species inflates itself and will not hesitate to charge at its assailant. Certainly the most conspicuous and sought after species, S.gottlebei was discovered fairly recently in the dry, hilly regions of Vallée des Singes, Isalo, south central Madagascar. 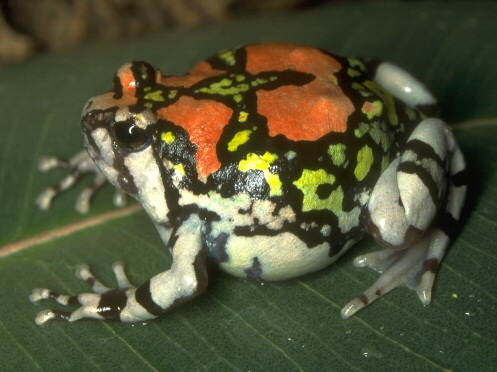 I must confess that I have seen fewer amazingly coloured and patterned frog with its ivory white, red, yellow, green and black mottling. Females grow to 35mm while males are slightly smaller. It is fossorial species to escape the searing heat and dry winds of that region. However its fingerpads are enlarged suggesting that it does climb and this may be due to it being a poor swimmer, so that flash floods of that region necessitates climbing small bushes or clinging to rocks to avoid drowning. A rather plain brown, grey or mustard species that is highly fossorial, appearing only after heavy rainfall to feed and breed in a phenomenon known as 'explosive breeding' typical of European spadefoots. Fairly widespread in the dry south west region of Madagascar. Unlikely to become popular in captivity due to this behaviour, although it is known to occasionally forage out in the open during day if very hungry. Females and males are similarly sized, usually about 30 - 36mm. Another rather plain dark brown species hailing from the entire western coastal area from north west Madagascar (Andoany) to the south west tip in Tolagnaro. Quite a small species rarely attaining 32mm. An explosive breeder after heavy rains during which huge number congregate in small temporary pools. Lays up to 500 eggs which float on the water surface and develop very quickly to metamorphose in just 3 or 4 weeks. Perhaps the least fossorial and certainly the most behaviourally interesting of the genus. Although is possesses a 'spade' on each hind limb, I have found is reluctant to burrow and certainly quite active in captivity. Attaining 50mm, it is a large but rather streamlined and agile species, attractively adorned in an unusual lime green and black pattern. 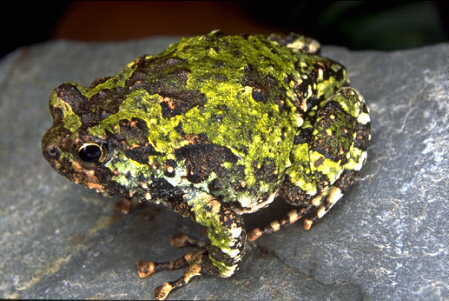 A mountain dweller of East Betsileo (central east & central Madagascar), it occurs in both savannah-like environments and sometimes in humid forest. A fairly active species, especially around dusk from the Ankaratra Mountains of central Madagascar. Occurs in cool, very dense forests where it may be active during day. The dorsum shows a grey, green colour with a beautiful yellow reticulate pattern. Like the green burrower, its front digit pads are enlarged suggesting it too is semi arboreal. Females represent the largest of the Scaphiophryne, attaining 55mm although it is not as stocky as other species. Like other Scaphiophrynes, it is also still fairly uncommon in captive collections. Burrowing frogs require little inventiveness where decoration of the vivarium is concerned. I prefer to use a wooden-surround/glass front with a glass tray. 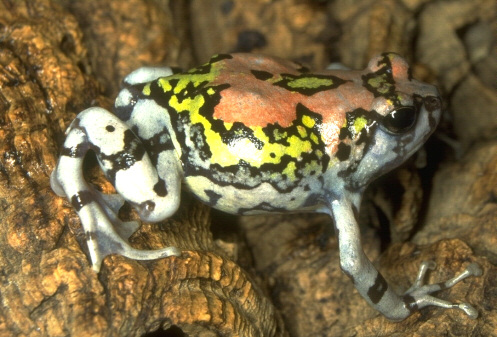 Being very inactive frogs, a quartet of adult frogs will comfortably live in a 60cm x 40cm vivarium. Fill the glass tray with 6cm of a damp but not sodden basal substrate mixture consisting of pre-sterilized chopped oak and maple leaves, sphagnum moss and river sand. Place several large pieces of cork bark or bogwood on top of the substrate and then locate a shallow water pan towards one corner. For semi-scansorial species such as S.marmorata, place several sturdy branches draped with reindeer moss. I have utilized a dampened soft foam sponge matt for a basal substrate in S.marmorata and although they seemed happy enough, from the digging actions of their hind limbs they do prefer a loose mixture in which to burrow. Also, they are not messy frogs, so cleaning out of the substrate need only be conducted every two weeks (i.e. replace or re-sterilize by baking in a biscuit tin in a conventional oven for an hour or so). Lighting should be subdued for these frogs, and I have found that of the species I have kept so far require no special temperature considerations, being quite happy from 64 up to 80°F. I like to mist the vivaria twice daily to retain some moisture in the substrate. These frogs can be very gluttonous, devouring a wide variety of bugs, grubs and the like although they can easily reject food if one type is offered constantly. Feed every 3 or 4 days with several items and coat every other sitting in a multivitamin powder, although initially they may refuse or spit out the coated item. So far very little is known about breeding these anurans in captivity. I have only found evidence of S.marmorata and S.pustulosa being bred in captivity. Apparently the 'rain method' used for Dyscophus (allowing the vivarium to dry out for approximately 6 - 8 weeks before imitating flash floods by filling up the glass tray with 5 - 10cm of warm water) has given the most success as these are denizens of arid areas with infrequent but heavy flooding. In southerly species (S.gottlebei, madagascariensis, brevis, calcarata) eggs are usually deposited in shallow, temporary pools, while in the more widespread S.marmorata and S.pustulosa, eggs and tadpoles are regularly found in many swamps of those regions. Eggs number between 3 - 500 and are usually deposited in small, floating clumps. Development varies from just 30 days in the 'explosive flood' breeders to 70 days in S.marmorata. Tadpoles feed greedily on fish flake and pellets and reach a total length of about 25mm. Eggs and tadpoles must be given consistently warm water (around 78°F.) to engender proper growth and metabolism. The German biologist Moleur found that temperatures in the sun-exposed temporary puddles in which he found S.brevis tadpoles varied between 74 and 95°F. Froglets emerged 24 days after hatching just as the water completely evaporated. The froglets of most Scaphiophryne, although quite small at 8 - 11mm, are very strong and tenacious creatures from the onset. For rapid growth offer a regular and varied diet, maintain individually in small plastic tubs which contain a base of moistened kitchen paper and keep at a temperature between 70 and 76°F. Maturity can be attained in a year. Longevity of all species is currently not certain.